Considering the weather of the past two years I never thought I would find myself welcoming rain but that is exactly what I did as I was writing this article this morning. By all accounts this rain was appreciated by both town and farm folk alike. Another personal benefit to me was that being confined to the indoors gave me the time to deal with an ever growing stack of paperwork including this article. This past week a variety of birds, especially Robins and House Sparrows, have hatched young and are presently feeding them. The interesting thing is that the young remain very quiet until the parents come in with food and then the "baby chirping" kicks in. Nests that were previously hidden and unnoticed are now out there for everybody to see exposing the young to potential predators. However, this problem exists for a brief time only as the young fledge quickly and serious predation is not a big problem. While birds like Robins and House Sparrows have already raised a brood and are getting ready to raise a second and even a third later on, birds like Goldfinches have just started nesting. 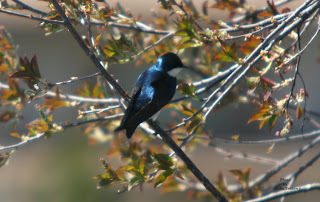 It is interesting to note that birds that raise multiple broods usually are either permanent residents or birds that arrive early in the spring and leave late in the fall. 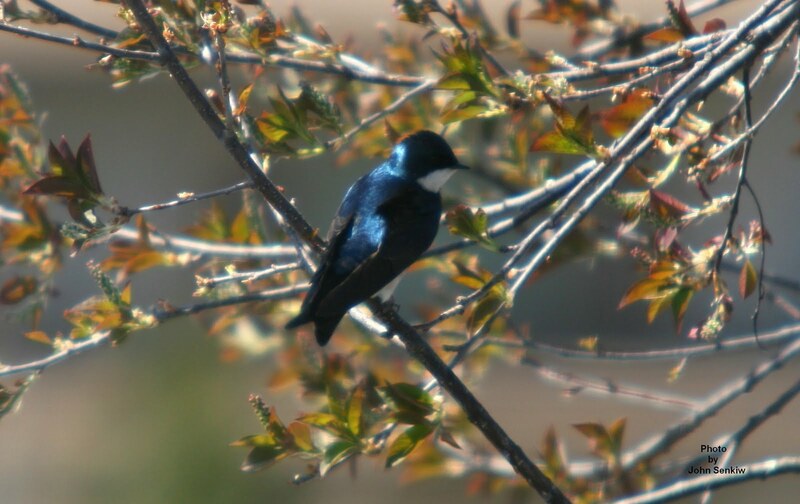 Birds, like Purple Martins and Yellow Warblers, that raise only one brood arrive later in the spring and leave earlier in the fall. 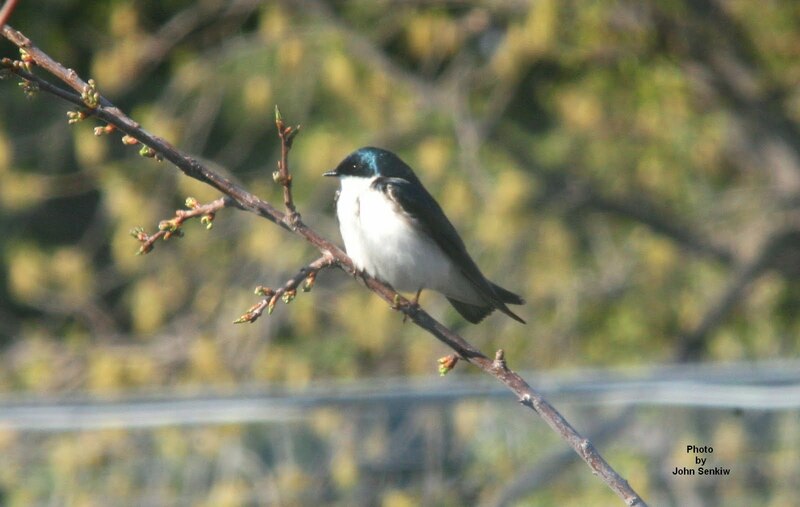 This past week or so we have seen a number of Tree Swallows flitting about in our backyard and in neighbouring yards checking out suitable nesting sites. Being cavity nesters they readily accept bird houses of just about any kind and anywhere. Our yard has several bird houses including one unoccupied one which the swallows did check out but nothing definite so far. My wife related a humorous incident that she witnessed on one of her early morning walks. A Tree Swallow was trying to land on the "O" on the stop sign by the school. Apparently, it thought the "O" might be an opening into a suitable nesting site! This is rather late for them to be still looking for sites and not already raising young and perhaps the lack of cavities has made the birds somewhat desperate and frantic. The male Tree Swallows are pure white underneath and steely blue on top from the forehead to the tail tip. When perched they give the appearance of being dressed in formal wear for a very important social function. The females are much the same with the black being more subdued. In a nutshell, the males show more contrast . Once seen they really cannot be mistaken for any other bird. This week's photos of a male (back facing) and female (front facing) were taken several years ago when the pair nested in a birdhouse in our backyard. The birds were very confiding allowing us to approach them within a metre or two before flying off a short distance and then landing again. They are very pleasant to have around and I hope a pair decides to nest in our yard this year. This past week I have seen the extensive flooding around Yorkton and Humboldt which brought back not so fond memories of the very wet 1950s - at least where I lived. Then, as now, flooding has caused small isolated bodies of water to swell their banks and flow to other similar bodies of water eventually connecting to lakes and streams that contain fish. As a result the fish end up in all sorts of unlikely places bringing fish eating predators with them, especially birds. One such group of birds is the family of terns and except for one species, the Black Tern, (see article No. 56) all are primarily fish eaters. 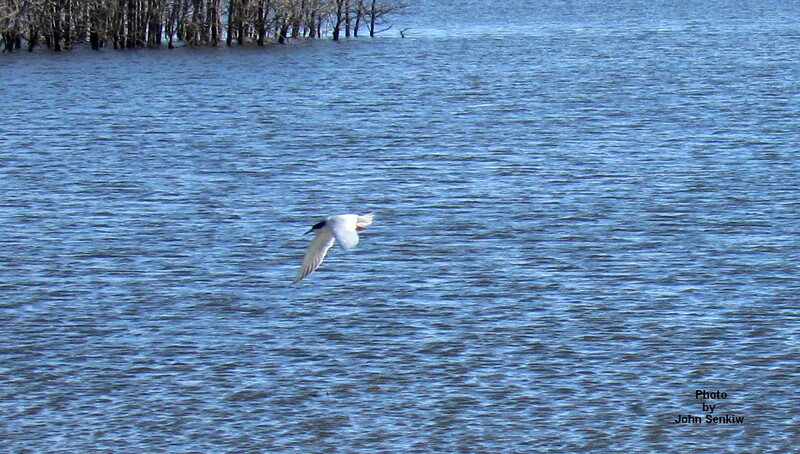 With the recent flooding and resultant movement of minnows terns can be found almost anywhere. This is exactly what I came across along a roadside near Waldsea lake just north west of Humboldt where we watched a small flock of black capped white terns feeding. 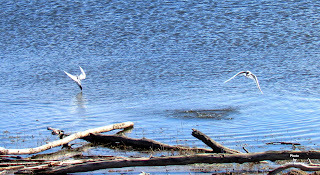 Just by watching them I could not determine with certainty what species they were because there are two very similar terns in the same area, the Common and Forster's. After taking a large number of photos the pure white wing tips, as seen from above, and the pure white bodies were the field marks that confirmed my suspicions that the birds were the Forster's Terns. In the Common Tern the corresponding parts are grey. 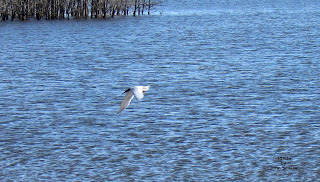 Had they been vocal, as terns usually are, identification would have been easy. The Common Tern utters a constant barrage of high pitched scolding calls similar to that of the Black Tern while the Forster's gives a raspy single call repeated leisurely which one birder described as a "croak". These particular birds must have been very hungry as they were absolutely silent . 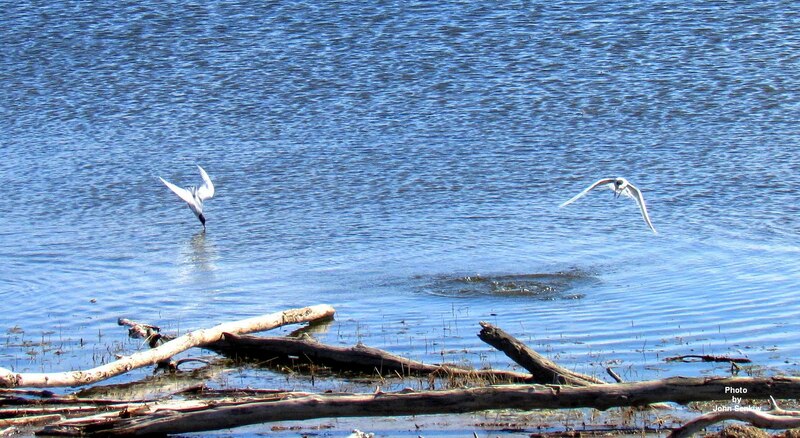 This week's photo shows three Forster's Terns fishing. One has just spotted a fish and is getting ready to dive; the second is in a dive and is just about to enter the water; the third is in the water and is just starting to emerge. Enjoy!